Monograph is devoted to research of modern development of informational and analytical provision of managing an enterprise that caused by complex of changes in organization and methods of making decisions and information processing with priority of new technologies and concepts. Information-oriented approach to development management system under impact of constructive attributes, trends and conditions of business activity is substantiated. 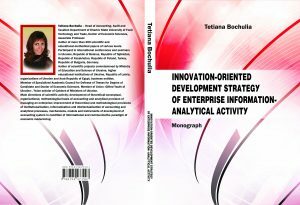 Proposals and recommendations that are set out in monograph and are formed for development information provision of managing and aimed at promoting intellectual and technological innovations, adaptation to changes, which inherent stage of transformation modern economy, achieve efficiency of change management and obtaining results from their implementation. Scientific research contains proposals that collectively solve tasks sustainable development of enterprises by making effective decisions based on relevant managerial information. For leading and young scientists, representatives of business and professional organizations and all interested persons, whose business is related to entrepreneurship. Modern development of the unitary states is the result of making use of considerable resources available to each economy. This implies a number of questions in the economic policy regarding how to utilize these resources rationally while maintaining them for future generations. This is a challenge for all those responsible for economic development, which enforces systematic reforms, equipping administration in management competence, rationalization of the legislation at central and local levels, and facilitating business. The present monograph being problem structured involves important issues of transformation of the Ukrainian economy in various aspects of its functioning. Substantive development by Oleksandr Amosha, Gennadiy Pivnyak, Vasyl Shvets, and Danilo Cherevatskyi in this regard is presented in the material related to autarchy vs. globalization in energy resources supply (pp. 6-11). Mykola Yakubovskiy, Viacheslav Liashenko, Bożena Kamińska, Oleksii Kvilinskyi introduce the economy modernization of the industrial regions (based on the example of Ukraine) (pp. 12-29), while Nadiia Shmygol presents complex assessment of plant growing development in the regions of Ukraine to work out recommendations for institutional changes in agriculture (pp. 30-40). Of interest is also the chapter by Olga Popova, Olena Tomashevska, and Svitlana Popova concerning decision-making based on the principles of sustainability for providing the profitable business activity (pp. 41-49). It is complemented by an article by Sergey Kravchenko “Scientific and educational complex of the economy as a basis for sustainable development” (pp. 50-60). In subsequent chapters, Mariya Khmelyarchuk discusses energy efficiency in the context of countercyclical regulation at the global and national levels (pp. 61-78), and Sergii Ivanov, Vasyl Perebyynis, Valerii Havrysh, and Yuliya Perebyynis present low-carbon economy: modern view on energy concept of Serhiy Podolynsky (pp. 79-90). In turn, Dmitry Lazarenko discusses the economic approach to global energy trends (pp. 91-99). Subsequently, Nataliya Dalevska gives characteristics of the institutional determinants of global economic development (pp. 100-111), and Oleksandr Melnychenko in his chapter “E-money payments in sustainable tourism development” presents the legal and financial regulations in tourism (pp. 112-125). The role of the Shared Service Centres is analyzed by Grzegorz Kinelski (pp. 126-136). Energy security instruments are discussed by Wojciech Drożdż, Piotr Głowski, Marcin Pawlicki, and Andrzej Midera (pp. 137-146). 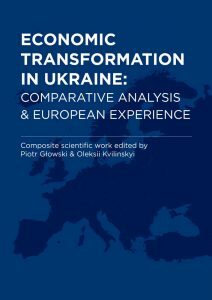 Interesting analyses are presented by Viktor Kovalov, Sergii Burlutskiy, and Svetlana Burlutska in “The ‘resources curse’ phenomenon in context of socio-economic transformation of Ukrainian economy” (pp. 147-155).